The HiRISE camera aboard NASA’s Mars Reconnaissance Oribiter captured this image of Mars’ surface, showing the presence of three different dust devils in the same region. Dust devils are common during the springtime on Mars’ northern hemisphere, when increased sunlight heats the surface and causes air to rise rapidly in spinning columns. The image was captured on February 11, 2012. Next Post Is Earth Alive? There are several other tracks in that photo. I take it those are marks from previous dust devils? Probably. 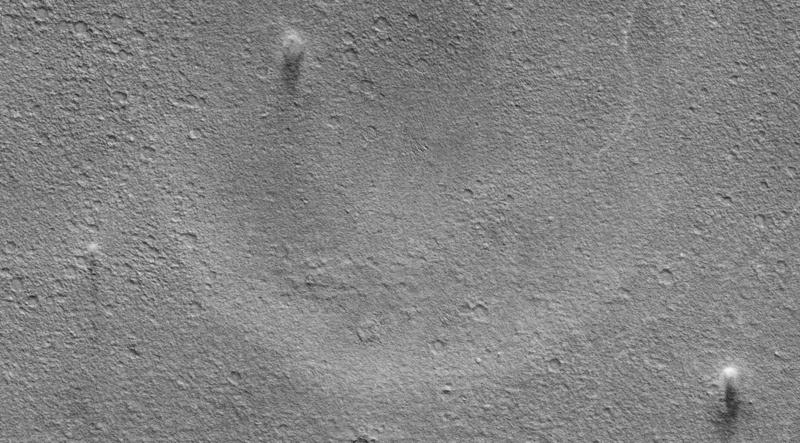 There’s the remnant of an eroded crater, and then smaller craters as well as the bright lines of previous devil tracks. “Springtime on Mars…” It’s funny to think of Mars as having seasons. I’m wondering how large these dust devils are. Based on the shadows, they may be several hundred meters high. In Mars’ thin air and lower gravity dust devils can reach impressive heights.